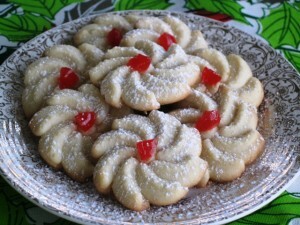 I have been making my favorite Christmas Cookies for a while now, but this year decided to try all new recipes. Pinterest pictures gave me lots of ideas, and links to sites with cookies I wanted to try, so I ended up printing about 10 new recipes. Then I wondered when will I find time to try all of these before Christmas, take pictures of the finished product and create a post. I was able to bake six of them by this post, and will try few more for the next post which will still benefit those who celebrate Christmas on January 6th. Since I followed these recipes exactly, I will just provide links to its original sites, but would like to mention that I did NOT use the higher temperatures some of these recipes called for (some as high as 400 degrees….??? ), but baked ALL my cookies at 350 degrees F, and that was just perfect. 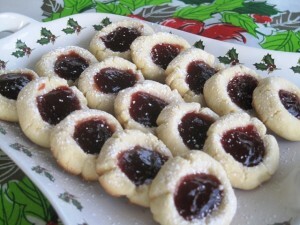 These are Jam Filled Butter Cookies, recipe I found on Allrecipes.com. They were easy to make, and I like their texture and flavor. I used Solo Raspberry filling, after I pressed it through a sieve to eliminate the tiny seeds. This recipe yields 40-48 cookies. Homemade Milanos based on William Sonoma Pressed Sugar Cookies. These cookies may be used as singles (as I make them), or made into sandwich cookies with melted chocolate or jam as a filling. 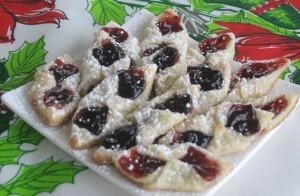 These are made with a cookie press, and yield about 64 cookies. Cherry and Blueberry Kolacky Bow Ties. The original recipe is from Jam Hands, but I made mine into bow ties, rather than Thumb Prints. These were OK on my list, but next time I would add some more flavor to the dough, and use less jam for the filling, since they were opening up at the bow tie seam. Maybe I will even try the thumb prints style, for better results. This recipe yields 4-5 dozen cookies. 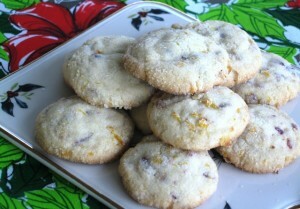 Cranberry Orange Cookies are very flavorful of orange and the cranberries add a nice tough to the overall taste and texture. Next time I would cut down on the amount of sugar in the batter, since the sugar on the outside almost makes them too sweet for my taste. The original recipe is from Culinary Concoctions by Peabody, and the recipe yields 4 doz. cookies. Melting Moments Cookies, but I renamed them for myself as Mini Snowballs….These are absolutely melting in your mouth, like a snow ball on a warm day..:-) They resemble my old recipe for Pecan Butter Ball cookies, but do not have any nuts, and are much lighter in texture…actually now I prefer these. 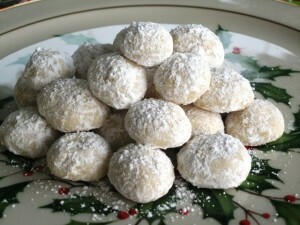 The original recipe is from Giverecipe.com, and it yields 33 mini pieces (about 1 tsp. of batter for each). 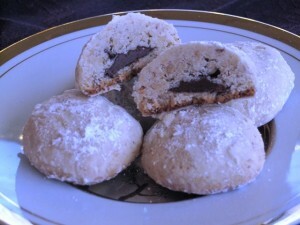 My last tested recipe for this post was for Nutella Filled Hazelnut Cookies, (they resembled the above Melting Mini Snowballs, but much larger). These cookies are also quite simple to make, and full of hazelnut flavor, derived from the crushed hazelnuts in the batter, as well as the Nutella filling. This time I was rather conservative with the filling ( I was concerned that it will run out during baking, collapsing the cookies), and only used about 1/2 tsp, but next time I will definitely use a full teaspoon. Also, next time I will make them smaller in size, more like an inch in diameter, rather than 2-3 as mine ended up to be. The hardest part about making these cookies, was the shelling and husking of the hazelnuts…I highly recommend finding all cleaned up hazelnuts, ready to use. The original recipe was found on Amendeleine site, and turned out only about 20 pieces, but her smaller ones ended up as 30 pieces. If you love Nutella, these are perfect cookies for you. Happy baking and tasting of these delicious cookies.